Besides being an author, Wendy Lawton makes dolls. In the quarter of a century she has been sculpting and creating original porcelain dolls, she’s amassed a substantial body of work. Her company, The Lawton Doll Company, has issued more than 350 original editions so far. Perhaps most surprising of all, collectors can't seem to get enough. Year after year, collection after collection, the dolls sell out. Wendy's work has garnered an impressive array of awards. In past years, Lawton dolls have been nominated for close to seventy industry awards, winning the coveted DOTY eleven times and the Dolls Award of Excellence three times. 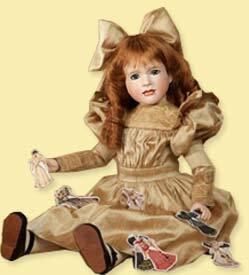 Lawton Dolls are painstakingly created in the company’s California workshops by the small team of dollmakers, most of who have been with the company for the best part of two decades. 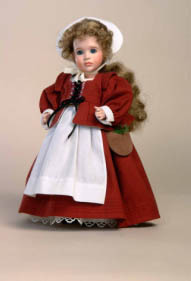 The dolls range in price from about $550.00 to $1200.00, with editions strictly limited in number and prized by collectors. Wendy plans to make dolls for many years to come. "Because the dolls represent humanness they seem to link us to one another," Wendy says. "A real bond develops between artist and collector, along with writing, I can't think of anything I’d rather do." To find out more, visit the Lawton Doll Company web site. After nearly three decades of sculpting and designing dolls, Wendy’s two favorite mediums for storytelling converged in her Daughters of the Faith doll line. "An artist knows that you cannot create from an empty mind,” she says. “You have to get involved in other worlds. I've always loved words, stories and literature. Over the years, most of my dolls have grown out of the literature of childhood. This time, though, I was able to tell the story both in porcelain and in words." "It's really the best of both worlds,” she continues. “Doll collectors discover the stories behind the doll and readers, on the other hand, enjoy a three-dimensional illustration of their favorite book characters." 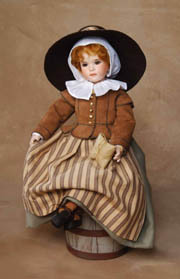 While these dolls were limited edition and are no longer actively offered by the Lawton Doll Company, some may still be available from one of The Lawton Doll Company’s authorized dealers. For a referral to a dealer please contact the Lawton Doll Company via their web site, or e-mail Wendy for more information. Mary Bunyan, the 10-year-old daughter of Pilgrim’s Progress author, John Bunyan, stepped right off the page of Wendy’s book, The Tinker’s Daughter, in the form of a detailed porcelain doll. The Tinker’s Daughter wears a cotton costume authentic to 17th century Restoration England. Her leather pocket holds the bit of blue ribbon that always reminds Mary of her mother. Also tucked inside is a sprig of rosemary, the herb Mary kept with her when visiting her imprisoned father. She’d crush the rosemary between her fingers when prison smells became too oppressive. Her leather shoes are replicas of those worn during the period, as is her cap. The portrait doll of Harriet Tubman grew out of the character from Wendy's first book, Courage to Run. "As I researched her life for this book, I fell in love with Harriet Tubman," Wendy says. "Her faith framed everything she achieved. By the time I finished writing the book, I couldn't wait to take clay and sculpt a portrait of Harriet as a child." This faithful depiction of Mary Chilton, a young passenger on the Mayflower - and the main character of Wendy 's book, Almost Home - brings history to life in this historically accurate wood and porcelain doll. The doll has a porcelain head and hands on a hand carved spring-jointed wooden body and sits securely atop a seaworthy wooden barrel holding her sister's oilcloth-wrapped gift. Her clothes are historically authentic right down to the leather waistcoat. "People picture the Pilgrims in the black and white costumes usually depicted," Wendy says, "But historical fashion scholars have proven that their clothes were often colorful and resembled Dutch and English yeomen clothing of the day." Mary Chilton was made in the Lawton workshops in California and was limited to an edition of 250. Wendy’s book, Ransom’s Mark, recounts the story of thirteen-year-old Olive Oatman’s journey west by wagon train. Renegade Yavapais capture Olive and her sister in 1851 after the massacre of their family. A year later the Mohaves rescue the sisters and tattoo them with the mark of ransom. The cruelty of Olive’s early captivity and the death of her sister from starvation bring Olive to the edge of despair before she discovers what ransom really means. 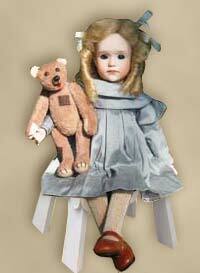 The Ransom’s Mark doll was made in the Lawton workshops in California and was limited to an edition of 50. One hundred and twenty-five years ago, teenager, Eliza Shirley – a “Hallelujah Lass”, as they were called in England – single-handedly started the Salvation Army in America. The story is told in Wendy’s book, The Hallelujah Lass. 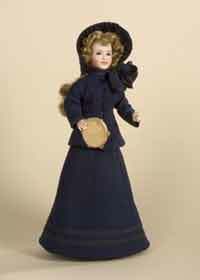 The doll, Eliza, is dressed in the navy wool serge precursor to the famous Salvation Army uniform and bonnet. She has strawberry blond hair and blue eyes. 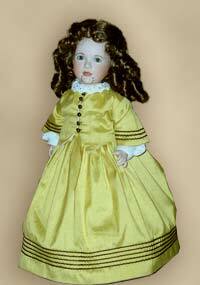 The doll was made in the Lawton workshops in California and limited to an edition of 175. Shadow of His Hand is a portrait of the young Anita Dittman holding her precious teddy bear. Even the dress and tiny locket are precise copies taken from one of the few photos Anita managed to salvage. Anita’s dress is baby blue dupioni silk. She has blond hair and blue eyes. 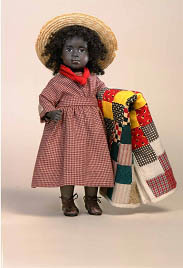 The doll was made in the Lawton workshops in California and was limited to an edition of 50.